The great screenwriter, William Goldman wrote a memoir many years ago called Adevntures in the Screen Trade. His central theme was basically that in Hollywood nobody knows anything about anything. In a hysterical post from the American Prospect they show the same for political punditry. At least when it comes to what President Obama should do or not do now. The continuing government shutdown has real impacts beyond the symbolic, in several states there have been closures of Head Start programs, Arizona is suspending public assistance, several government contractors are furloughing their employees, Governors are scrambling to sustain programs where federal funding is in danger and the list goes on. 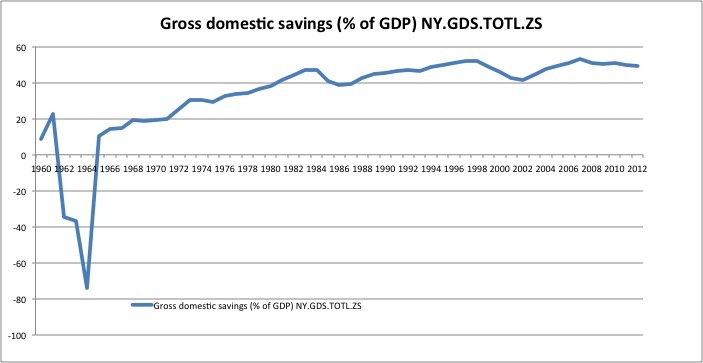 In past years we heard on and on about how the federal deficit and debt was going to turn us into Greece. It couldn't possibly but that is a discussion for another day. In fact, the government shutdown is turning us into Belgium. A few years ago Belgium set a modern record for the longest streak without a government. Well, without a permanent government. 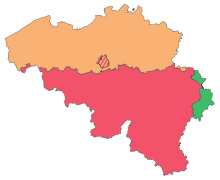 Te election of 2010 resulted in a very diffuse vote and many parties held seats in Parliament. Belgium is complicated because of linguistic, political and regional differences. All you really need to know is that the BIGGEST party got 17.5% of the vote. So the country was ruled by a temporary government for almost two years. They became a sort of dysfunctional joke and even though the EU is headquartered there, Belgium had no real influence over anything. Which is what crossed my mind when President Obama was forced to cancel a trip to Southeast Asia. The meetings will be dominated by the Chinese and it will diminish US influence a bit at a time where our leadership is needed to show the example of democracy to Indonesia, Malaysia and Brunei. Except we come off like Belgium. Too splintered to show anything. Some politicians too concerned with the appearance of power to actually recognize that they have already won everything they could rationally want and more. The cuts to the federal budget over the past year have brought the deficit down hard and fast resulting in slower economic growth than target and higher unemployment than could ever make sense. When is Democracy not so Democratic? In Political Thought this week we discussed the following from the Boston Mayoral election first round of voting. In this system voting is done on a non-partisan basis and the top two vote getters move on to the final election on November 5th. This election is remarkable in that long time incumbent Mayor, Tom Menino, is retiring so there is an open race for the first time in 20 years. The dynamics of a once in a generation opportunity attracted a field of very strong candidates. Not surprising then, the result of first round voting was split so that the two winners emerged with a combined total of just under 36% of the vote. The question posed to the students is what constitutes a "democratic" method of electing officials. Under our system we have two forms of democratic participation, direct democracy, which allows the people through mechanisms like initiative and referendum to have a direct say over the passage of legislation or creation of constitutional law at the state and local level. The other form is representative democracy where we elect our officials. According to the eminent political scientist Robert Dahl, Democracy consists of far more than just the form of selection, but that form must allow for the weighting of their preferences equally with no discrimination because of content or source. There is more in his work, A Preface to Democratic Theory. At first blush that seems to be the case. All voter preferences are equally reflected in that in totaling 112, 674 votes all are counted equally. Until they need to turn into a decision and then the top two finishers win and the rest don't. Which means that the preferences of over 64% of the voters are not reflected in the participants moving onto the final round. 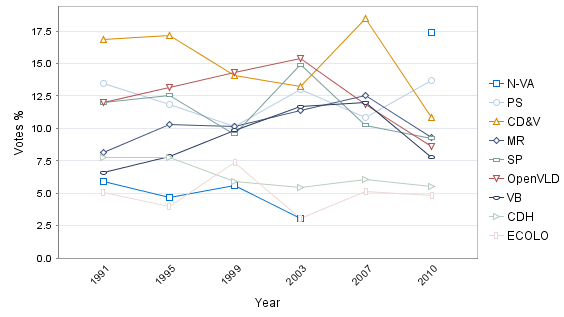 In the second round the winner is the candidate with over 50% of the vote, but does that actually represent a majority given that the first choice of almost two-thirds of the voters is no longer and option. This is why advocates for voting reform pose options such as Alternative Vote, where voters can rank order their preferences. Under that scenario the complaint heard about the Boston result, crowded field of candidates including six candidates of color, yet two Caucasian males emerge. For example, under an Alternative Vote, by rolling up the lesser preferences of the bottom candidates someone like Charlotte Golar Richie could have challenged the top finishers. It will be interesting to see if the second round of voting this year results in a higher turnout. In 2009 when Mayor Menino faced a serious challenge the first round brought out 81000 voters in a four way first round and nearly 110,000 in the run-off between Menino and Flaherty. In that case almost 75% of the voters in the first round saw their choices move on to the second round. Full disclosure, as readers know I did spend some time helping Marty Walsh in this election and I will be thrilled when he is elected Mayor. I just re-watched Sydney Pollack's great love letter to Kenya, Out of Africa. Hard to do and not think about the heart aching events in Nairobi unfolding this weekend. Coming on the heels of the horror of the violence in Washington, DC it reminds us of the dark places where beauty is shut out. Madness. On the Dissent Magazine website there are two wonderful articles about the late scholar Marhsall Berman, who passed away last week. The first by Michael Walzer. 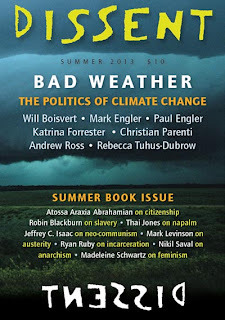 My friend Mark Levinson writes about running into Berman and/or seeing his book in far flung places. I had a similar experience maybe five years ago in London browsing through the gift shop at the Tate Gallery (of all places) and seeing a pile of lovely new copies of All Things Solid Melts Into Air. I remembered the book and wanted to read it (a voice in my head said someone I knew loved it) but decided not to buy it then and there because I was already carrying too much on the trip (as is my norm). A few months later visiting NY, I asked Mark about the book and he beamed and told the story that is in his remembrance, about wanting to do for economic policy what Berman did for the consideration of Marx, urban planning, literature and modernity. So after coffee I went to the St Mark's bookstore and bought their remaining copy and spent a few days lost in this remarkable work. I was struck by his reminder of the lyricism of Marx's prose, as well as the evocative description of St Petersburg . So much so that given a chance to go from London anywhere for a few days at Christmas a few years ago I went to St. Petersburg to experience his description first hand. It was a profound experience. I was wonderfully privileged to be able to view the Nevsky Prospekt through his literary eyes. His writing also helped me plug an intellectual hole in thinking about the modern, progress and rationality. All fixed, fast-frozen relations, with their train of ancient and venerable prejudices and opinions, are swept away, all new-formed ones become antiquated before they can ossify. All that is solid melts into air, all that is holy is profaned, and men at last are forced to face . . . the real conditions of their lives and their relations with their fellow men. One of my students is writing a paper on The Communist Manifesto so I was pleased to email him the pdf from The Nation of Berman's own review. Hopefully this work will not be lost and students will continue to read it. For me, a dog eared copy of a well read book is perhaps the greatest gift I can think to give an author. New Yorkers go to the polls tomorrow and there is a chance to elect two progressives whose careers I have followed for many years. Not only that we are just a few weeks away from the same chance here in Massachusetts with two other very special people. In New York City the primary election for local offices is tomorrow. A abdicate that gets 40% of the vote and has the most votes wins the nomination outright. If the leader does not reach the threshold then the top two finishers have a runoff a few weeks later. Gale Brewer and Bill DiBlasio are on the verge of outfit victories in their respective races. I have known Gale and followed her career since the late 1970's where I was a classmate of her brother. Gale served the community as the top aid to then Councilmember Ruth Messinger. From that time until today, as an elected official in her own right, she has been a zealous guardian of the interests of the people and he neighborhoods under her care. For a New York looked to change course after the Bloomberg years there could not be a better choice for Manhattan Borough President. Bill De Blasio is the Public Advocate for the city where he has fought for the interests of working families against hose who would use their money and power to withdraw services and further divide the city by race and income. As Mayor Bloomberg inadvertently pointed out, De Blasio and his family represent the cosmopolitan diversity that makes New York such an interesting and special place. He looks to be on the verge of hitting the 40% threshold and his success would send a powerful message to Democrats across the country about how to talk to the hopes of the average voter. In Boston, State Representative Marty Walsh is an excellent candidate in a crowded field to succeed retiring Mayor Tom Menino. His personal story is very compelling as he overcame addiction, physical challenges and being shot (yes really) to serve his community in the Legislature. He has worked as an Iron Worker and a union leader and represents everything that you hope for a in a progressive leader. It is a unique opportunity for the City after Mayor Menino's long rule to set another positive direction. To replace now Senator Ed Markey in the US House a close friend is also in a credible field. State Senator Katherine Clark is an exceptional public servant. A talented and hard working woman she could be making a fortune working as an attorney for a top firm anywhere. Instead she has served the Commonwealth as an attorney, state representative and now State Senator. Her instincts are very progressive; a supporter of single payer who has made women's rights and the minimum wage as central issues in her campaign. She has taken on tough issues in the State Senate working through changes to the law regarding municipal health insurance and pensions, forging a consensus among unions and state and local officials which represents major achievements. I can only hope that these four people have continuing chances to serve their respective constituencies in the roles this aspire toward in the upcoming elections. They can use help through Act Blue or their own websites. But if you live in one of their communities, please at least make sure you vote. The Senate Foreign Relations Committee vote today (10-7) in favor of an amended resolution in favor of military action against Syria contained significant changes from the original draft. At the insistence of Sen McCain the resolution now includes language committing the US to changing the balance of power on the battlefield in Syria. The resolution now goes beyond what the President indicated as his goal, punishing Assad for the use of Chemical weapons. The process is now thoroughly confused as to the goal. It didn't make much sense to me to have the US military kill people because Assad killed people. Now the goal of launching military force to bring Assad to the negotiating table with the rebels sounds like a significant escalation, even with the restriction of no US troops on the ground. Worse, it is a continuing line of thought that I have heard since Vietnam about the vain hope for a democratic element between bad choices at either end of the spectrum. Through military action we can encourage democratic elements that will (miracle of all miracles) come into line with US values and foreign policy objectives. If you buy that I have a unicorn to sell you. 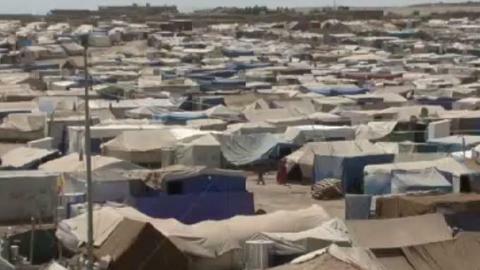 In the mean time there are two million refugees from Syria that could use significant help. The situation is so bad people are leaving Syria to go to iraq. How Wrong Can One Column Be? In Saturday's NY Times Roger Cohen has a column bemoaning the threat to the so-called "special relationship" between the US and the UK because of the Parliamentary vote against PM Cameron's proposal to support military action against the Syrian regime because of their use of chemical weapons. Who is the villain in this set piece by Cohen? Well it turns out it to be Ed Miliband the leader of the opposition Labor Party. Why? Because Miliband does not want to give carte blanche to the US for determining the direction of the British foreign policy. 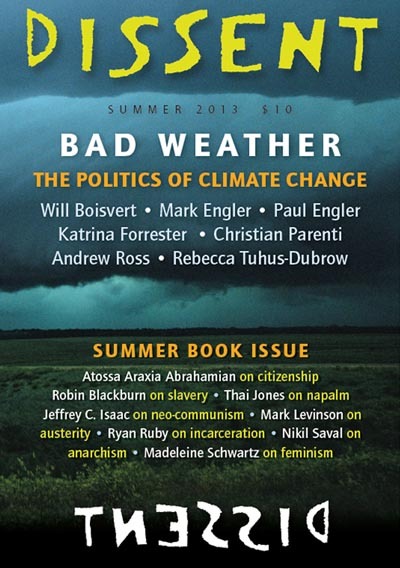 Cohen, whose newspaper played a sorry role in promoting the lies of the Bush Administration in the run-up to the Iraq War, passes off the lies that infuriated the British public (particularly Labor Party supporters who left the party in droves for the anti-war Liberal Democrats) as "cherry picking". Cohen is sharp enough to understand that the British people are a bit skeptical of US claims (of anything really) that seem to justify war. Yet he ignores the evidence he suggests, and which as a Political Scientist I can see is rather damning for the chance of the US convincing these folks of anything. He also makes reference to disagreements in the past, such as the Suez Crises, but why did those disagreements (the UK left Iraq long before the US) not end the special relationship? Considering the history from colonial times obviously the US and the UK have managed to work together pretty well all things considered. So what if there are different approaches to the value of military intervention with respect to the horrid Assad regime (which has existed through two generations). Perhaps the weirdest part of the column was his attack on Miliband. He claims that Ed's brother, David, would have supported the motion. He may have but I wonder how much of the labor party would have been left after such an action. Cohen seems to forget that the Blair government went out of their way to deceive the world about the intelligence on Iraq. They sent representatives to DC just before the release of their deceptive dossier and had it edited by the Bush Administration before they released it to the British public. It is entirely understandable that politicians of all stripes (many Tories and LibDems voted against the motion or abstained as well) would be reluctant to go down the road to war. Just a few months ago, Blair in a BBC interview brushed off the lies, justifying the war on the basis of the horror of the Hussein regime. Apparently Cohen and Blair do not find democratic processes more than niceties to be subverted. I wonder how Cameron feels about it today? Happily today President Obama decided that the constitutional process could work in the US and he will share decision-making with Congress. Perhaps the discussion will be an honest one and members will point out to the world that their will be innocent loss of life in these strikes. The terrible irony is that because of the constraint on international action Assad can't be held responsible directly. So civilians will die so we can protect civilians from attrocity. Is this the best way? It would be a good conversation to have as we and the civilian population of the country still pay the price for the Iraq War. Sorry Mr. Cohen but they still are related and we live in a country that has deep suspicion about these types of pronouncements. There is significant discussion among economists and media observers about the growing momentum of capital flows leaving emerging economies particularly in Asia. In recent weeks we have seen a major drop in the values of currencies such as the Indian Rupee and the Indonesia Rupiah. To some extent this is predictable. Because the US Federal Reserve has signaled a winding down of its latest Quantitative Easing (QE) effort, US interest rates have started to rise. The rise in interest rates indicate an expected increase in the rate of return on funds invested in the US. Therefore, funds will flow from other parts of the world into the US. This is seen in the appreciation of the value of the dollar versus the currencies who might have strengthened during the period when interest rates were near 0 in the US. "Mr Lai makes a broader point about Asian foreign exchange reserves as a whole. Between 2008 and 2012, the total accumulated by China, India, Korea, Taiwan, Hong Kong, Singapore, Indonesia, Malaysia, Thailand and The Philippines almost exactly matches the growth in the US Federal Reserve’s balance sheet due to quantitative easing. As he says, the correlation appears very high." It will take a bit of time to make sure this correlation reveals causality but it does match theory. The flood of cash used to prop up the banks in the US and other advanced economies flowed to emerging economies which had potentially higher rates of return. Unlike the 1990's when that flow represented loans denominated in dollars recent capital flows have been int he form of FDI (Foreign Direct Investment) which might not be so destabilizing unless there is wholesale divestment. So far there is a split in this analysis with Krugman saying it is a natural rebalancing and not much of a problem and others saying a new crisis could be on the horizon. The issue that comes to mind is whether these countries have the capability of protecting their currency and their capital basis from these runs. Economists hate capital controls and see them as an impediment to further investment and inevitably ineffective. 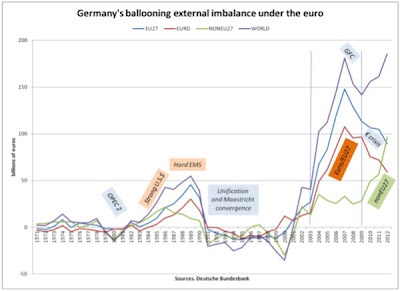 But if the recent depreciations herald a major outflow with consequences (stagflation on a major scale say) then the emerging countries will need to examine these tools to control capital in and out. This summer we went to the brink on the student loan bill and the Congress eventually passed a version that had overwhelming support. The President signed the bill into law and said, "our job is not done". The President is correct because due to the self imposed constraints on the discussion, the result is a bill which potentially leaves higher education in significant financial straits. The goal for reasons unknown, was to allow college loan rates to fluctuate with the market. Apparently members of Congress and the President think there is a market for interest rates. The public justification was this would get "politics" out of setting the rates, apparently Congress couldn't be trusted to balance the concerns of affordability of education, "costs" and interest rates. Since 2007 Congress had fixed interest rates which reached a level on Stafford loans at 3.4% for undergrad and 6.8% for graduate loans. We will skip the obvious question as to why there is a surcharge for graduate students (obviously causing bigger interest costs hopefully offset by higher lifetime earnings, unless you are a public school teacher who is required to take the classes and pay the money). 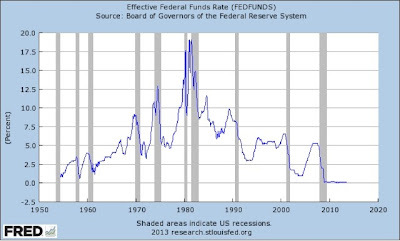 As you can see from the following graphic, interest rates in recent years have been very low as a result of extraordinary efforts by the Federal Reserve to keep the economic implosion from getting worse. So the federal government has been taking in more money than they have been lending as a result of the fact that the Feds can borrow at far less than the rates charged to students. One important constraint is the justification for the surcharge in the form of a claim of high collection costs for student loans. The theory goes that because there is a default rate for student loans there should be a recovery in the form of higher rates for all borrowers? Why should a diligent repayer have to shoulder the burden of a higher cost because a small number of students default? How is that their fault exactly? In essence the government is increasing the likelihood of default by making students pay higher interest rates as a result of some other students defaulting (many of whom never graduate and never get to benefit from the higher lifetime earnings). The major issue is the contention that somehow the market sets interest rates. Nothing could be further from the truth. 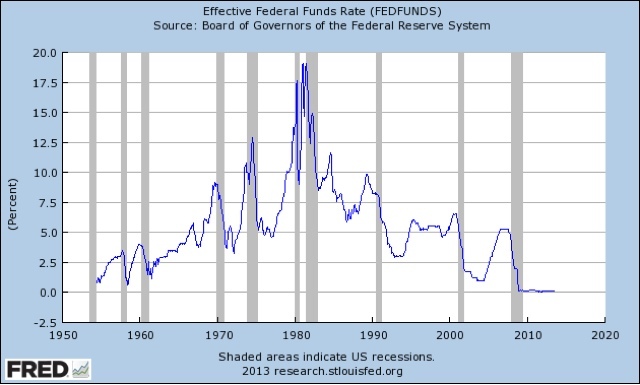 Go back to the graphic which shows the Federal Funds rate over the past six decades. This is the rate set by the Federal Reserve s a result of their open market operations. 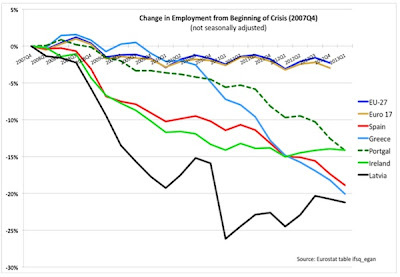 Notice the large fluctuations? It is because they set the rates in response to the goals of monetary policy. Higher rates, less demand in the economy. So how does the market set 10 year government debt rates? The market determines whether the rate is 2.8% or 2.9%. The Federal Reserve determines whether it is 2.8% or 4%; what does this have to do with a fair rate for student loans? Since Congress has rarely used fiscal policy in recent decades, monetary policy has become more salient. So why should college student loans be tied to the tool of monetary policy? Wouldn't a more rational policy based on some idea of fairness and the acknowledgement that market mechanisms overprice college loans (the whole reason we have government loans and guarantees in the first place)? If the societal return is such that permanent rates of 3.4% work why not leave them there permanently instead of the possibility of huge fluctuations causing problems for the higher education sector? My internet friend Dean Baker (whose blog is a daily breakfast treat) was a bit busy to take on this whopper from Thursday's NYTimes on economic growth. Apparently the reporter was bound and determined to show that growth in the advanced countries (US, Europe and Japan) was taking over the BRIC's as an engine of worldwide economic growth. After telling us that the EU posted a 1.2% annual growth rate for the second quarter over the first, Nathaniel Popper claimed that economic acceleration is coming from the "old world". Perhaps the most invidious aspect of the article was the info graphic here which shifted to nominal dollar figures to compare the four BRIC countries against the US, the 27 European Union Countries and Japan. Outside of comparing 29 countries (with larger economies) with 4 (with larger populations) and the fact that the graphic still showed the 4 with nominal increases greater than than the 27, and ignoring whatever index they use for the various currencies, they then slip in a pretty picture about relative stock market performance. Apparently they didn't read any of the many articles in the NYTimes about the huge injections of liquidity into the economies of Japan and the US, and to a lesser extent Europe, which have helped propel the stock markets to new highs. The BRIC's haven't been participating in the same manner. In fact, what they have showed is that stock market performance looks to be a function of central bank activity (that would be an interesting article). Now the reporter might be forgiven for all of this if he wasn't very adept at simple excel formulas where he could have compared the relative sizes of the US and China economies and their growth over the past year. Basically China and 7% is bigger than the US and 1.4%, even given that the US economy is a bit bigger than that of China. The punch line of course is the press release from the EU indicating that year over year growth for the EU was a NEGATIVE 1.4%. They will not be much help to the global economy until they get off the austerity kick which has decimated the economies of Spain, Portugal, Greece, Ireland, Latvia, Cyprus, Italy, etc... Need more proof, check out the shrinking workforce in these countries, here. I get that the newspaper business is a bit stretched these days which is why we have seen such rapid changes in ownership, but I would hope the NYTimes could invest in some editors that could force their reporters to do some basic math. I am outlining a work on public policy focusing on a theory of public policy constraints, meaning what limits are placed on the discussion of policy solutions based on what is acceptable within the political, economic and social environments. I want to illustrate this with a discussion here of homeownership policy. In a subsequent post I will use the same framework to discuss the last phase of the debate over college loans. Gretchen Morgenson has a piece in Saturday's NY Times (August 11) on the Administration's proposals related to the secondary mortgage market. She makes the point (primarily that there are many details still to be revealed by the Admin and the Senate which is working on a bipartisan solution), that in mortgages there are two primary types of risk; default risk and interest rate risk. 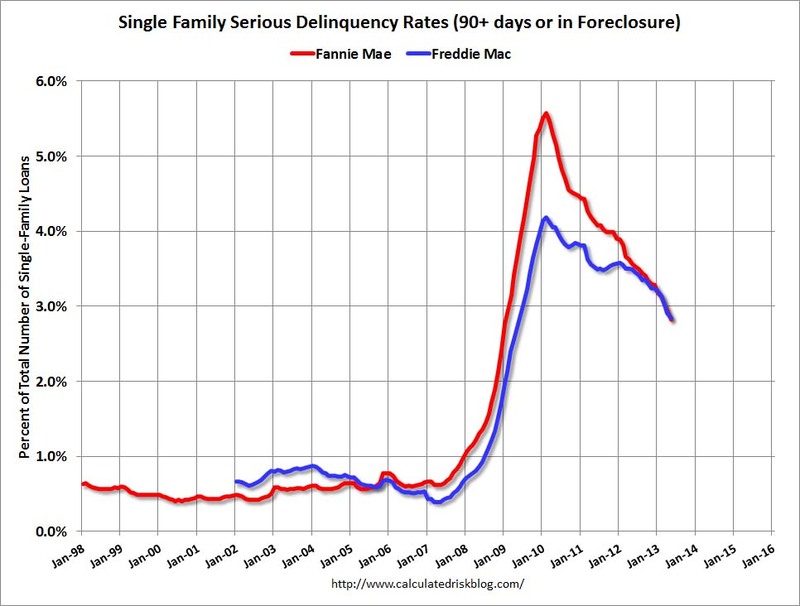 Fannie Mae and its little cousin Freddie Mac are in the business of providing secondary support for the mortgage market. As banks provide mortgages that meet the underwriting requirements of the firms, they purchase the mortgages which provides a fee for the banks and further liquidity to make more home loans. The firms went public and had a Board and management that operated them in a "for-profit" manner. They got into serious trouble last decade as their portfolio of Mortgage Backed Securities (MBS) ballooned. Apparently the Board was concerned that they were losing market share to firms actively engaged in the sub-prime market. Since they were prohibited from purchasing loans from that segment they instead purchased MBS which tanked in value as the housing bubble burst. To compound the problem, Fannie and Freddie were highly leveraged and nobody thought to point out the difficulty of a business model that involved borrowing money to buy risky bonds. As they went under in 2008, the Bush Administration stepped in and seized the firms resulting in overwhelming government ownership of the entities. Even though there was no explicit government backing of the firms, the government determined that the impact on the housing market and the economy would be too bleak if they were left to fail. The government injected significant capital into the firms; and after a few years the firms are now repaying the government at a fast enough pace that there is a good chance of a profit. The fate of the firms has improved because of the decrease in the default rate on loans as shown in the figure above. The firms have a commitment to repurchase mortgages that they package into securities if the mortgages fall into delinquency. With less delinquencies and stronger numbers in the housing market the firms are strengthened and profitable. This is despite the fact that with the crash of the housing bubble Fannie and Freddie were responsible for almost 90% of the underwriting of the market. The credit crunch after the crash meant that the private market for secondary mortgages dried up. With Fannie and Freddie under government control the mortgage market was able to recover even after the devastation of MBS and other forms of securitization. Given strong quarterly results they are paying substantial dividends to the government. Yet, the President and Congress are working on proposals to return control to the private sector. It is not entirely clear how much of the slack the private sector will be able to absorb. The interesting question is why? 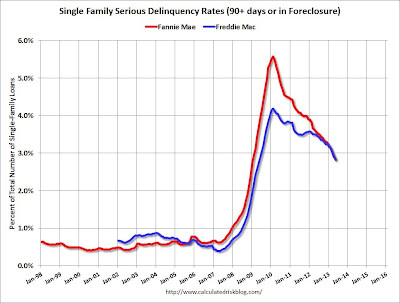 Given the progress and stability of Fannie and Freddie under government control (which is how they started many years ago) why is there concern about ending that steady hand? This is the point of the concern about constraints. 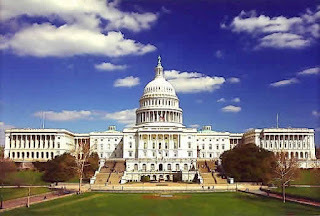 In US policy discussions and the development of solutions, why have the government do it if the private sector is willing? This prejudice against government activity smacks more of ideology rather than analysis of what works for the public. The US Government supports the market for homeownership in a thousand ways big and small. The imputed rental value of owner occupied housing (wonkish), the deductibility of mortgage interest, the deductibility of property taxes, some purchase expenses, the capital basis of housing investment, etc... are all valuable means the government has for participating in the market. They represent a subsidy for the ownership of housing at the expense of those that rent (and the benefits largely to those with high incomes that can itemize). There are some small programs that subsidize and encourage the development of affordable housing, but the major constraint in this area, as well as others, is the prejudice against overt government action. It is fine if government support comes through tax expenditures, just don't have government do something where there is a potential profit to be made by the private sector. And oh by the way, it is fine if you keep the government in the business of guarantees so they can help insure the private sector risk. As Joe Nocera of the NY Times points out, Fannie and Freddie are very effective at both the underwriting risk and the interest rate risk. They can afford to hold the mortgages and hedge risk so the value of their binds does not crater as interest rates rise. Why foist this problem on the private sector only to come to their rescue when the trouble starts? The World Economic website which provides economics commentary and research has an interesting piece on youth unemployment. They compare the experiences of Germany and Singapore with that of the rest of the advanced world. They are particularly interested in the variables of education, meaning do the standard western universities prepare students for todays jobs (with the emphasis on ICT) or they based on an outdated model? They find that Germany has much less of a problem of youth unemployment than the rest of Europe (7.9% versus 22.6% in the rest of the EU). Singapore, which wins raves for its efforts to promote innovation, rates highly in their index for Global Competitiveness. Yet they seem to miss the point. Germany and Singapore have lower unemployment rates in general compared to the EU and most all advanced economies. Why? Is it because of their specific policies related to innovation? Or rather their efforts to promote exports which allow them to run a decided current account surplus. I conclude it is more the latter than the former, and as always it can't be sustainable or rather transferable to other economies. 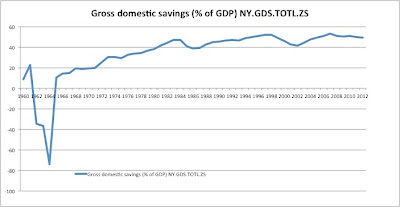 The observation is not unique and has been commented on by other economists such as Krugman. If you want to lower unemployment you need to generate demand. 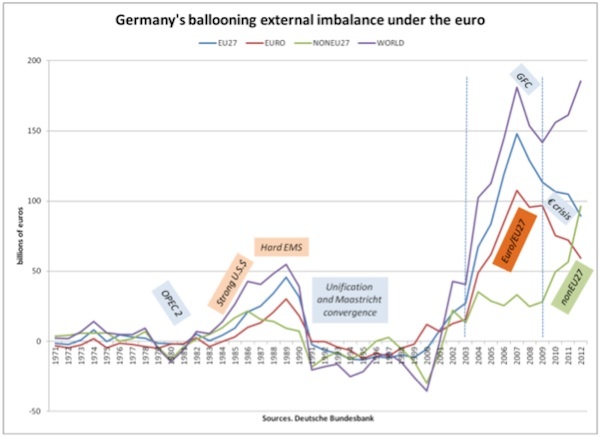 While not everyone can do that through exports (for every surplus dollar in places like Germany, Singapore and China there must be a deficit in the US, Greece, Spain, and elsewhere), everyone can do it through fiscal and monetary policy. Instead of using the "race to the bottom" wage policies advocated by Tse, Esposito, et al which will only displace unemployment from children to parents, why not generate enough demand to increase employment across the board? Of course doing that implies you end austerity. After three weeks on the road some random observations, quirky thoughts and a thank you or ten. It doesn't matter if you are at the equator or not, in the summer it is hot. Singapore is just a bit above the equator, certainly as close as I have been. It is in the low 90s there every day all year. It is also as humid as I have ever experienced. But it was even more brutal in Vienna and Prague. Just brutally hot all three weeks. The greatest service invention ever is free laundry at hotels. In the Sheraton in Singapore and the small Hotel Louren in Prague they give you that lovely service. I booked the Louren because it had air conditioning and it was a good choice. Otherwise I would have slept even less. Add in the weather at home before I left and I have seen over 90 ever day for over 6 weeks I think. All this is a long way around to saying that I was silly to bring jeans on this trip as I never wore them. Public transit is awesome. As someone who has a long commute by car (the only option) and rarely gets to take a subway, tram or bus it has been great fun to have great mass transit at my disposal for three weeks. In all three cities the service ends at midnight, so without giving too much away (really about how boring I am) I think I have only done cab rides to and from airports (3) and two or three late nights. Otherwise I was walking or riding and haven't driven a car since July 12. Tourist passes are great inventions and used them in all three places. The quirky thing is where you can buy them. In Singapore they make you travel one station in either direction from where I was to get the pass so you had to waste a fair. Same in Prague except the hotel sold them. Not sure why you can't just get them in the machine. By the way Prague you have to retrofit the machines to take the new 50 karuny coins. Street food in Singapore is the best though obviously exists everywhere. 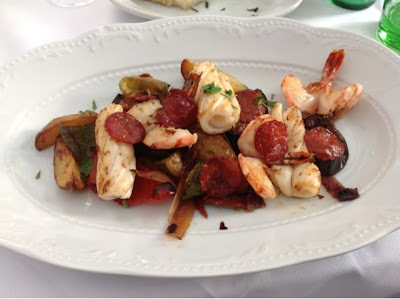 Danieli in Vienna is my fav Italian restaurant anywhere as weird as that seems. See above for an example. I have been making halusky wrong for years. Need sauerkraut not spinach, but might not ever change. No need for a camera as between my phone and ipad I think I got great photos of the journey. The Austrians are as proud of their wine as the Czechs are of their beer. Both are right. 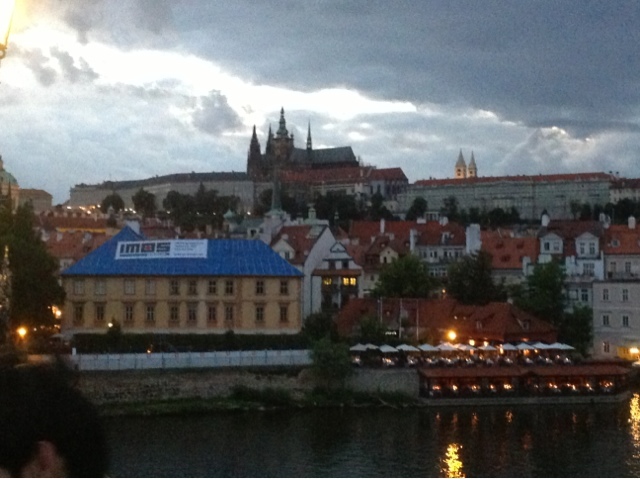 The street cafes in Prague close at 10 PM. There are some interior courtyards and beer gardens open late. The beer garden in Vinohrady is a gem. The coffee everywhere has been universally excellent and I am very picky. 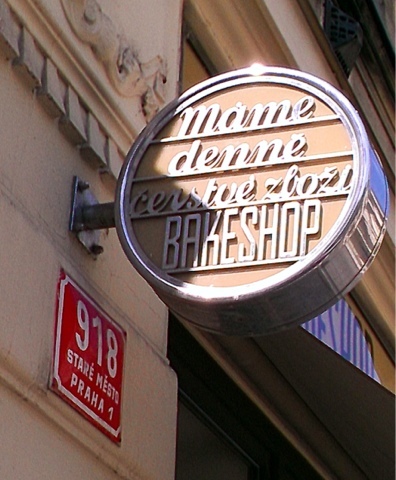 The Bakeshop Praha on Kozi is a marvelous institution and I have visited here for many years. The new owner is doing a great job maintaining this gem. The original owner, a wonderful American woman who came here right after the revolution, passed away late last year in London. RIP Anne Feeley. Too much graffiti in Prague, too little in Singapore. Happy birthday today to Dennis, Brianna and Barack. Looking forward to reading Catherine Schine's new novel "Fin and Lady". My friends who already think I am too nerdy will groan that I brought and read so many academic books. I have gotten used to reading on the iPad and appreciated the company from old friends Phillip Kerr (Prague Fatale) and Robert Littell (Young Philby, largely set in Vienna). There are many thank yous to give. Riley Ohlson and Silvia Romanovich for fitting me into their respective travel plans and introducing me to some super folks in Prague, only sorry they never met. NK KT and Rodney for taking time from their work to show me some of real life in Singapore. The group from CGU including Tim Howard, Ankur Mehta, Carlos, Neim and many students and faculty who made Singapore such a fulfilling experience. Common Ground publishing who hosted the conferenceon social sciences at CharlesUniversity. The folks from the hotels in the three cities and London who kept me clean and sane. All the folks from home who have read and liked my posts. And Meghan whose infinite patience and indulgence made this adventure (and everything else) possible. I am listening to a giant thunderstorm in the middle of the night and ready to be home. Soon, but one more stroll before I go. I had to take a bit of time from writing here in order to finish the paper that I delivered yesterday at the conference. Very interesting international group of scholars talking about every conceivable topic related to the social sciences. So now my professional responsibilities are over for the trip and I can enjoy three free days in Prague. Last night I had dinner at Cafe Slavia on the banks of the Vltava with a perfect view of the castle. I had the chance to share the dinner and some highlights of the Old Town with two grad students from China who had never visited here before. I am always pleased how much I remember and can find here without getting lost. Beauty doesn't adequately describe the vista here. Certainly my photos don't do it justice. As you walk and look around it is as if every step has some significance. Here was where the police beat a student leading to the events of fall 1989. A few steps away is the jazz bar where President Clinton played the sax with Havel on stage. Oh look that theatre, not the classic one, but the modern building, the Magic Lantern is where they made plans for the revolution. Here is Slavia where they went to talk nonsense that the secret police could hear and report something to the ancient regime about to fall. And there is the view, the river and castle and all the eager tourists gasping at the architectural detail of the buildings and the cameras lifted up and up. Now the bridge, the heart of the tourist center, the religious statues ready to come to life agin and haunt Kafka's nightmares once more. The narrow passageways through the old town that lead past the iconic clock and suddenly into a massive open square. There is Hus, patiently waiting and contemplating the irony (very typical Czech) of being a religious martyr that symbolizes Czech nationalism in a nation where next to no one is religiously observant. Another two blocks and Wenceslas Square where the tanks took position in 1968 and poor, brave Jan Palach self immolated in 69 and hundreds of thousands gathered in 1989 chanting the name of the leader who defied the Soviets and wanted to lead with a human face. I wonder if the younger Czechs understand the importance of the museum they live in here. The 20th century happened here with a vengeance. It would be wonderful if it was some kind of respite from the 21 st but real people live here in this museum. They are dealing with all the challenges typical of the contemporary world. The people seem distant on the street but stop and ask something in polite czech and they help, smile and send you on your way. I have been lucky to get to know some folks here over the years and they are very warm and friendly. They know what a special place this is and why so many of us come from abroad and clog their streets all year round. They are still growing as a nation. Small and uneven heir progress in fits and starts another government fell in a bizarre scandal a few weeks ago and there will be elections soon. I have seen the future and the past on this trip. 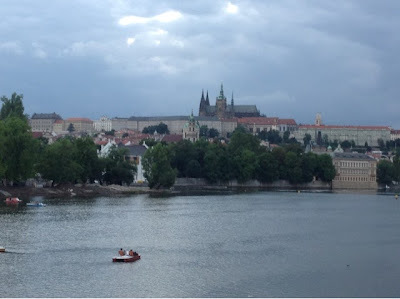 The precise (Singapore), the regal (Vienna) And the profane (Prague). As always when I leave I hope to keep some of this place with me and to be back soon. 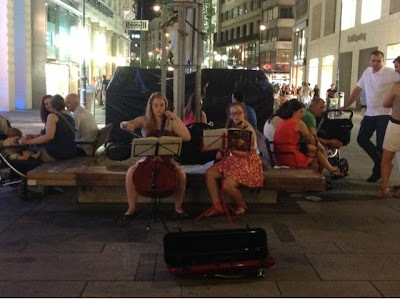 Walking through Vienna in the late evening hours I paused to hear two very talented young women play a classical piece. I mean Berkeley College top of the class talented, just playing on the street. The sound of music in the center of the city made me think of some of the differences between Singapore and Vienna. Two small places with high standards of living, diverse histories, some striking similarities and stark differences. I have been slow to post as this trip has been long and tiring but exciting intellectually. Too much time awake at 4 AM though in very different time zones. There was no music on the streets in Singapore, nothing but the sounds from the shops and stalls in the crowded quarters such as Chinatown and Little India. In Vienna street music is everywhere. In the morning you can hear the radios as the restaurants are cleaned from the busy night. Working people are present in Vienna. You see dusty construction workers on the subway, some neighborhood cafes and the trams after their shifts. While in Singapore, I never did see anything similar. The subway in Singapore is immaculate and filled with young people and office workers. 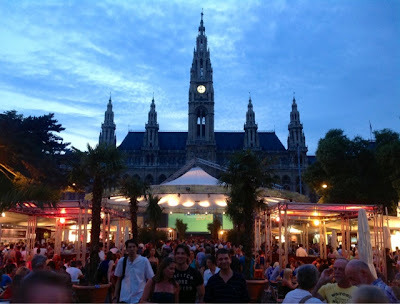 In Vienna there are actually signs that life doesn't end at 30. The subway in Vienna is typical of the way it feels in one of our cities. It looks used but is fast and efficient and like a modern city has a good complement in the trams and buses. I didn't use the bus in Singapore but they were present and the transit network is vast. Remember cars are quite expensive there so they need to heavily invest in public transport. Most importantly, Vienna and Austria have the political pluralism that Singapore has yet to achieve. In the Straits Times there were discussions during my visit about what political pluralism would mean for the city-state. The opposition holds only 6 seats in the unicameral legislature out of 87. They didn't win one seat until 1984. It is not likely that other parties will have a significant impact on Singapore for many years. Austria is another case entirely. Like many European countries its politics are divided between the center-left Social Democrats (including the brilliant Mayor of Vienna, Haupl) and the conservative People's Party and the xenophobic Freedom Party. There are Greens and right wing populists that make for a divided parliament but vibrant political life. Both are prosperous, small and ethnically rather homogenous. Austria is one of the few EU countries where real estate values are higher today than before the crisis (so too Singapore, can you say bubble in German?) But there is no other choice but messy democracy and all that it implies for developing the full rights of humanity. With the noise and dirt comes the violins that sound like weeping into the warm vibrant summer night. I am taking a small break from writing about Singapore to draw attention to a major story that appeared in the NY Times over the past few days. It appears that Goldman Sachs has been operating Metro International, an aluminum warehousing operation in a manner that inflates the price of the commodity in a classic illustration of "rent seeking". The activities described if accurate, account for high profit and low value added activity, shifting costs to customers and consumers. In Microeconomics, we teach students that there is no profit in the long run. We make this counterintuitive claim because profit is different in an economic sense than it is in an accounting sense. In accounting profit is the net of revenues and costs, But in economics we are concerned not just about those costs but also the opportunity cost. 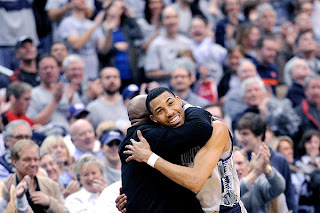 This is the cost of forgoing the next best opportunity. Meaning that if the accepted rate of return in the economy is 5%, then anything below that is a loss. In the long run we assume that firms can't exceed that rate of return because if there are opportunities for higher than normal profits then firms will enter the market and drive down returns (given a lack of barriers to entry, meaning free entry and exit). There is an incentive then for firms to try to create profit by manipulating markets or government to capture higher than normal profits, economic rent. In the Goldman Sachs example, the Federal Reserve gave permission for banking institutions to speculate in the commodities market in 2003. 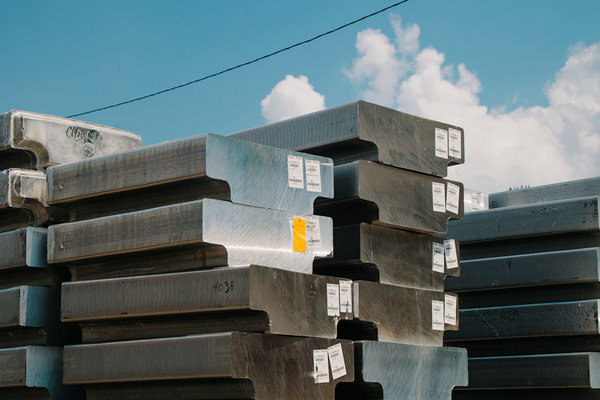 Goldman subsequently purchased Metro International which offers warehousing services for aluminum. According to sources cited by the Times, Metro has significantly slowed deliveries of the commodity, at the same time they make money charging rent to customers for warehousing space. The amount of material under the control of Metro has skyrocketed from 850,000 tons in 2010 to over 1.5 Million tons today (it was less than 100,000 tons in 2008). This is rent seeking writ large. The Federal Reserve has to decide over this next year whether it will continue to allow the banks to control commodities. It is obvious that Goldman does not need aluminum for its operations (nor do the banks like JP Morgan Chase which is trying to do the same for copper), yet they have identified a way to capture profit by simple financialization. There is no value added to the customers, there has been no operational or technological improvement by their ownership just more money flowing to the pockets of execs at the banks at the expense of other businesses and consumers. They manipulate markets and regulators to allow them to capture above normal profits, rent seeking. 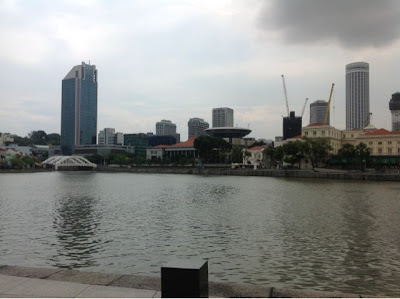 Those who know Singapore know it is a relatively small city-state at the tip of a Malaysian peninsula. Singapore won its independence from Malaysia 48 years ago (after previously getting independence from the UK). It is a relatively new country with new cultural, political and economic foundations. You do not have to spend much time here to see the richness of the multicultural environment. The Asian influence is strong with a Chinese, Malay, Indonesian and Indian components. I have a Japanese friend here and I am certain there are representatives of other Asian ethnicities here as we'll. There is a Chinatown, Little India and an Arab Street. 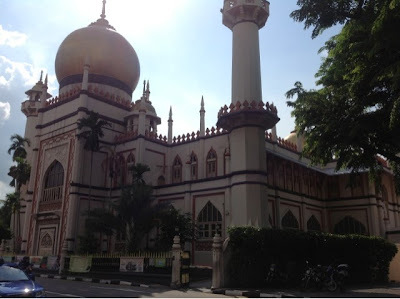 There is the great central mosque, the Sultan Mosque. It anchors the Arab Street area (which is really a quarter). 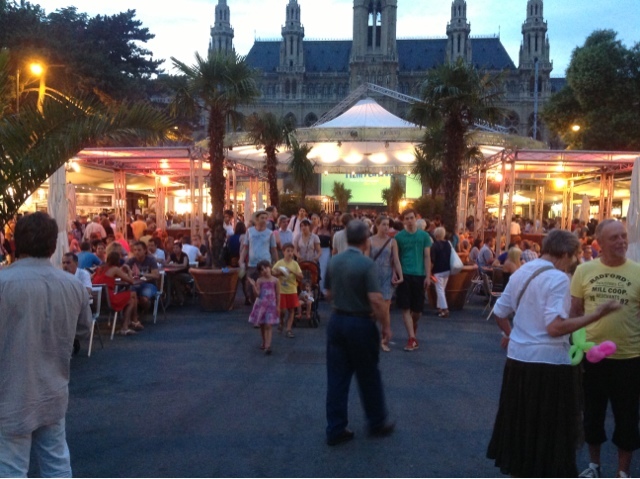 In honor of Ramadan there are special food and shop activities in the latter part of the day near the mosque. Yesterday we met with officials from the Singapore Management University which attracts students from around the world and the director of the institute we visited was an Indian national who has lived here for over 30 years. And it works. While the political elite is largely of Chinese descent there are significant contributions across the ethnicities. 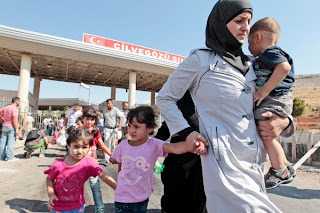 Why does this multiculturalism work? Since Singapore is a small place; 287 square miles and 5.4 million people there is a rational basis for the need to make sure everyone has the capability to make a contribution. Since the birth rate is relatively low, there is a big emphasis on immigration. For example, foreign students are invited into Singaporean universities with subsidized tuitions if they are willing to spend three years working for a Singapore registered company. With this policy they combine the support for human capital development and that of openness to people's from other countries. Typical of many policy choices here, it is rational, there is an incentive, so they do it. By the way there are many Caucasian visitors and residents here. One of the interesting features of Singapore is the intense capital investment in infrastructure. Everywhere you go there are good roads, access to public transit and sidewalks. This facilitates life in a densely populated area. Not surprisingly, given the market orientation of the system here, there are incentives and disincentives to lessen traffic and consume public transport. To own a car here is quite expensive. In fact, car ownership requires payment of a fee that is in excess of the open market value of the car. So cars which are expensive to import become even more expensive to operate as you are paying the price of the car again as a one time excise. On the upside they offer lower (basically free) prices for the subway during early morning hours. The subway system is comprehensive and efficient. It is convenient and comes frequently. Clean and comfortable it is one of the best transit systems I have ever experienced. The nation invested significant funds in its deep water ports to capitalize on its strategic sea lane position. I had an amazing view of the shipping lanes on my ride in from the airport and I have never seen so many big ships off a coast. All said the smart investments have contributed to Singapore's high rate of economic growth and high quality of life. I have been here all of almost two days so not by any means an expert but it is a very interesting place. Doing serious research on economic performance here and their focus on human capital for talks later this week. My first takeaway is that I will never complain about the humidity in Boston again. Wow, dripping here constantly. Never felt humidity like this before and that is saying something as I spent my entire life in the Mid-Atlantic and New England regions where humidity is the norm. The urban environment is quite green in that there are trees and grass everywhere. 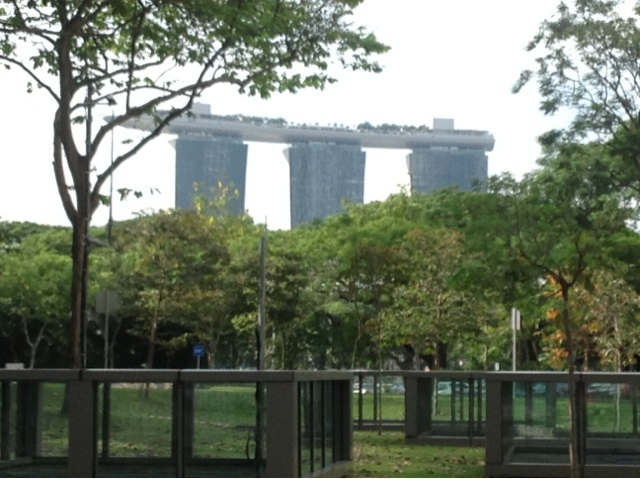 This photo is of Marina Bay and the three towers of the casino/hotel there. The top is a a park. This is a common site in Singapore as they have rooftop gardens on some buildings including one across the street from my hotel. Singapore is not green in the recycling sense as there is no sign of any efforts. Not sure where all the garbage goes however. The people are friendly and cafe life is similar to Europe in that nobody bothers you and service is no speedy. But just relax and take it in and enjoy. At least that has been my philosophy so far. Favorite coffee place is Symmetry which is near the Arab Street area and the great Mosque. Best mocha ever and the food is tasty. http://nyti.ms/1317mHM The decision of the ECB and Euro Zone leaders to "tax" deposits in Cypriot banks is a phenomenally bad decision that must cause a giant run on their banks and weaken the entire Euro Zone. Part of the problem that places like Cyprus struggle with are constant capital outflows from current account deficits. Those out flows are made for with inflows from Russians and other convinced of Cypriot stability. So much for that. It is inconceivable that this haircut of depositors could work. Should have just nationalized the banks. 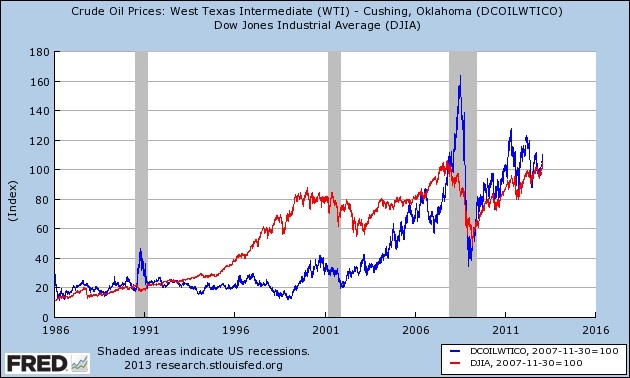 As someone who watches the markets for equities and commodities fairly closely I have been interested in the incidence of relationship between increases in oil prices and the increase in the value of stock market indices like the Dow. 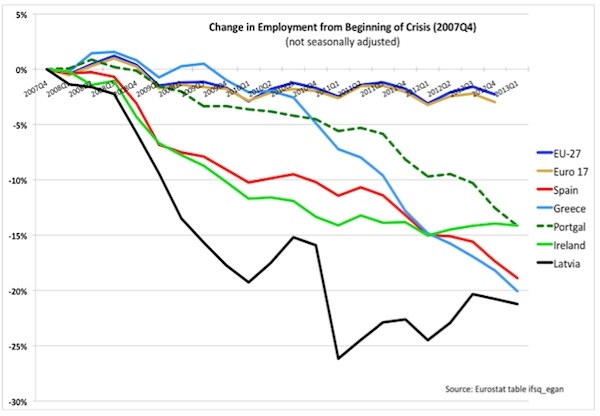 Here is a chart of the changes over a period from 1986 until today. It was with much warmth and no small amount of pride that I watched the ceremonial swearing in and second inaugural address of Barack Obama. The tradition of the inaugural address is typically more poetry than prose. "With malice toward none", "all we have to fear, "Ask not what your country can do". But there are few addresses that have transformed national discussion and remain in our political lexicon for generations. "For we, the people, understand that our country cannot succeed when a shrinking few do very well and a growing many barely make it. We believe that America’s prosperity must rest upon the broad shoulders of a rising middle class. We know that America thrives when every person can find independence and pride in their work; when the wages of honest labor liberate families from the brink of hardship. We are true to our creed when a little girl born into the bleakest poverty knows that she has the same chance to succeed as anybody else, because she is an American; she is free, and she is equal, not just in the eyes of God but also in our own." Strange positioning occurring in Mass regarding the temporary appointment of a Senator to replace John Kerry once he is confirmed as Secretary of State. Congressman Barney Frank has indicated in recent days that he is available for the appointment which would bridge the period from Kerry's resignation (which hash't happened yet) and the special election which would be a few months later. Sources tell me that the front runner for the Governor's nod (its his appointment) is former Admin and Finance chief Jay Gonzalez. I am hearing from fellow Mass progressives that there is some momentum for Barney Frank and that the Globe will endorse the idea in the morning edition. Personally I think Barney Frank would be among the best qualified people in the country to fill the role (let alone Massachusetts). I can't imagine what political consultant Doug Rubin was thinking when he dissed the idea of a Frank appointment, but Rubin isn't Congressional scholar so who cares. 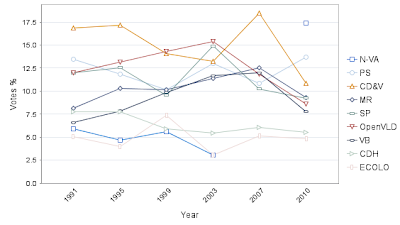 Having been absent from the ASSA/AEA conference for a year I am concerned about the dying of the critical retrospection following the financial crisis of 2007. While there was significant discussion of the rupture of conventional wisdom during the Great Recession there is little continued examination in that vein. Too much of the discussion is about the deficit and debt and very little about unemployment. Some panels mention inequality but few solutions challenging the limits of narrow range of policy solutions. Currently listening to the discussion at a panel on Media and Economics and the takeaway is that the important Econ journalism is through the scholar/bloggers like Paul Krugman, Brad deLong and Justin Wolfers. Christia Freeland accepts that idea ... Econ journalism needs to challenge the conventional. More thoughts tomorrow from the plane.